With my cheering section after the race. Nigel was clearly unimpressed. I have not posted a single thing to this blog in months, but I definitely felt compelled to come back to it after running the Cherry Blossom 10 Miler. I initially signed up for the race since the distance and timing fell perfectly into my Pittsburgh Half Marathon Training, but this ended up being a wonderful experience in itself. Let me begin by saying that I was pretty nervous for the race. Until race day, I had never attempted a 10 mile run. I am working myself up for Pittsburgh and last week I ran 9 miles, but I was still on edge because this was a new distance and if I failed miserably there would be witnesses. Race day was a blast though and things went pretty well. I attempted to begin the run with a pace group from Gold’s Gym just to be certain I would finish strong. I decided that I wanted to aim for the 10:00 min/mile group since that is normally a good conversational pace for me, but I ended up getting restless part way into mile 2 and chose to leave the group. It was wonderful to have the group at the beginning of the race though because things were pretty congested at the start and our pacer was fantastic. She worked hard to ensure that everyone stayed on pace and I don’t think I would have been as aggressive on my own moving through the crowds. After I left the group and started to feel warmed up, I chose to slowly increase my speed as things moved on. I still wanted to be comfortable since my ultimate goal is the Pittsburgh Half on May 3rd and I did not want to risk injuring myself. I was pretty pleased with my pace and still felt energized at the end of the course. 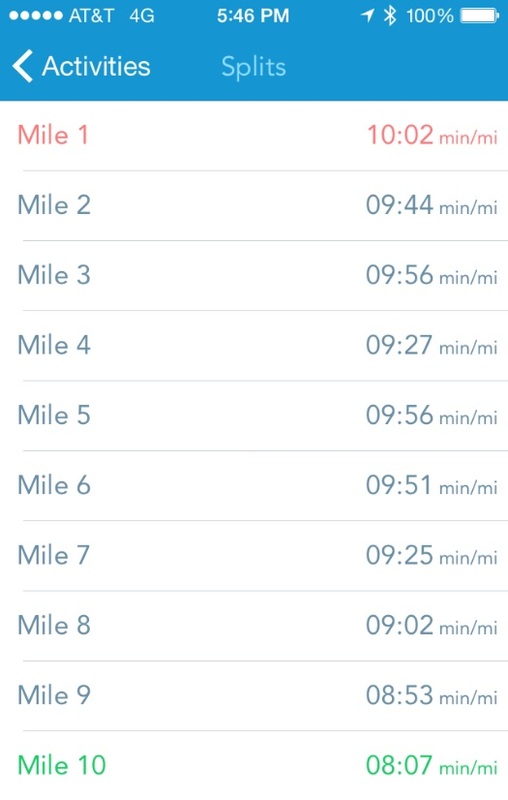 My splits according to my RunKeeper App are included below. The scenic views throughout the race were gorgeous and I loved running through the cherry blossoms, particularly near Haines Point. I think I will take some of my long runs around that area in the future if I can figure out how to get there when the roads are not closed off. I also loved that they had music along the course. I especially enjoyed the drum line towards the end of the race, where the motivation was especially important. I was also extremely happy that the race course was relatively flat, but I am pretty worried for Pittsburgh – since it is such a hilly city compared to DC. Overall, this was a very positive experience and I hope to do it again next year. The only disappointment on race day was due to an accident along the race course that required a separate investigation. As much as a half-mile was cut out of the course due to this incident. A bit of a bummer, but the race organizers handled it very well and executed their backup plan with ease. I had also heard rumblings about doughnuts being available at the finish line, but failed to find them anywhere. Despite coming out doughnut-less, and half a mile short of the 10 mile distance, I was super-impressed with everything! If you are on the fence about entering the lottery for this race, many other individuals have blogged about their experiences. Most have been overwhelmingly positive. 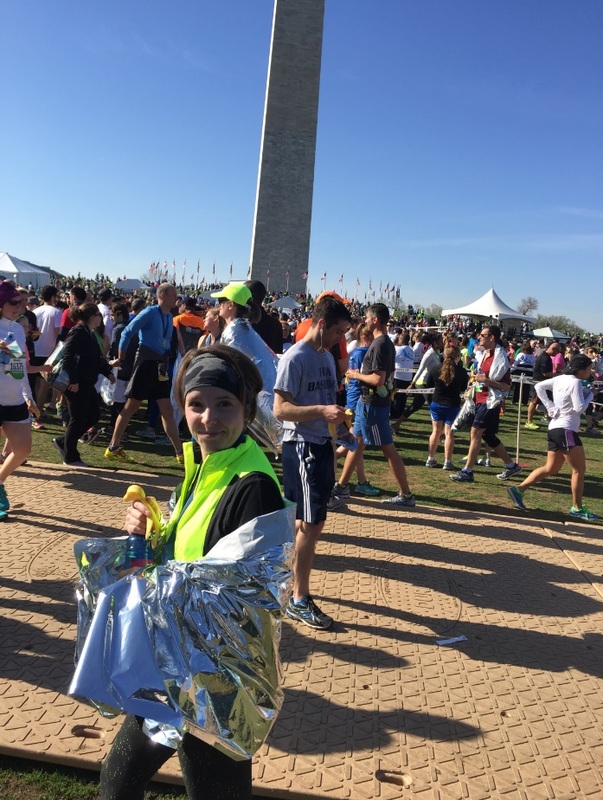 One of my favorite running bloggers – Courtney of Eat Pray Run D.C. – has a great recap on the race. 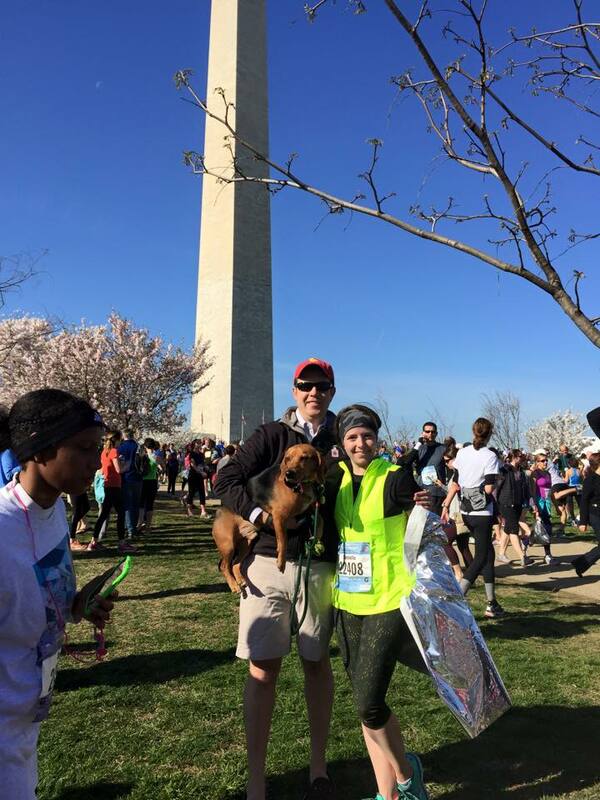 The Cherry Blossom 10 Miler also has a Race Recap Party with tons of great blogs you should check out. PA friends – if you enter the race lottery next year and get in, you are welcome to stay with us!